From the end of September through this first week of October, photographs from Fashion Week have absolutely dominated my Instagram feed. For the last three weeks, I have obsessively tracked the happenings of Gigi Hadid, Kendall Jenner and, of course, Anna Wintour. And while I have swooned over the masterpieces designers have churned out for the upcoming Spring season, there is one trend that has specifically caught my attention, and not in a good way. This style, as seen on the runway, and even on the streets of Commonwealth Avenue, has been dubbed a “braided part.” These braids, more recently seen on Kylie Jenner and Cara Delevingne, are essentially glorified corn rows. And herein lies my problem: corn rows stem not from the white designers, models and socialites that now find it appropriate to flaunt them on the runway, but from a culture that had previously been degraded by the same people that now promote them. Corn rows were originally donned by women of color to tame their natural curls. And even today, the fashion industry marginalizes black hair as the antithesis of western female beauty. For decades, black women have worked their hair into painful braids in order to hide their own natural appearance. Aisles in grocery stores are still dedicated to the taming and flattening of black hair into a more Caucasian style. Ironically, black women also wear corn rows to be able to tie in certain weaves and wigs that give their hair the false appearance of straight Caucasian hair. With that said, for predominantly white women, in the predominantly white world of fashion, to then take an aspect of black culture that was formally marginalized by that same industry, and publicize it as “trendy”, is not only cultural appropriation, but cultural arrogance. The upsetting irony of models with Caucasian hair then choosing a hair style that appropriates a black hair regimen to enhance their own white look only reinforces the idea that fashion is a white women’s world, and beauty, a white women’s standard. As a white woman, I can only partially understand the frustration other women of color must feel when looking at this new “fashion statement.” So I asked an African-American Boston University student, sophomore Vanessa Kuria, what she thought of the braided-part fad. In an effort to appreciate its origin, corn rows have been called “ghetto fab,” but even this description shows the arrogance of appropriation. A black woman with corn rows is not analogous to a black woman living in the ghetto. By saying that corn rows are “ghetto”, fashionistas only further stereotype the culture that they degrade. Here a black woman was taught throughout her childhood that her natural hair was not good enough, and that her braids were something to be laughed at. 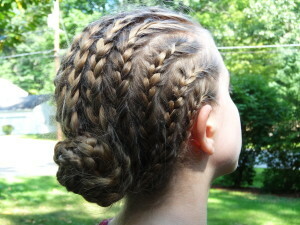 According to fashion week, however, these braids are fabulous, so long as they are introduced on a white model. Corn rows are not a fashion statement. They are a culture. And by strutting them down the runway and the streets of Boston, white women only further strut down the path of appropriation, blind to stereotypes they promote and the culture they walk on.